Superboy and Robin, the sons of Superman and Batman, take center stage as a reluctant super-team in an all-new series bursting out of the DC Universe Rebirth event! 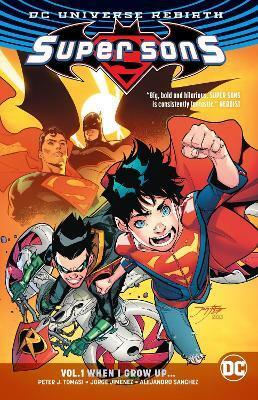 When Robin (Damian Wayne) discovers a connection between a series of mysterious crimes and the aftermath of the bizarre and deadly Amazo Virus, he needs Superboy (Jonathan Kent) to aid in the investigation. But when the duo learn that the teenage Kid Amazo has plans that put the entire Justice League in danger, they need help from an unlikely source: Lex Luthor! Even if the odd couple of young heroes survive Luthor's assistance, they'll have to face a possibly greater threat: the combined forces of Robin's tutor, Alfred Pennyworth, and Superboy's mother, Lois Lane!